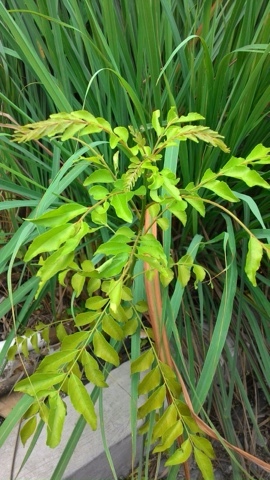 Curry Tree / Curry leaves / Pokok Kari. A small tree, often reaching up to 6m, with trunk up to 40cm. The leaves are aromatic, making it one of the important spice in cooking, the leaves are usually eaten cooked or baked. The berries and flowers are usually not eaten. Native to India and Sri Lanka, is a sub tropical and tropical tree in Rutaceaea family. Curry leaves have antioxidant, antimicrobial and anti inflammatory properties and thus, widely used in Ayurveda medicines. Good source of Vitamin A and calcium. Aid digestion and prevent diarrhea. Curry leaves also good to prevent diabetes. Soap making, body lotion, potpourri, aromatherapy, perfume, bath and massage oil, facial steams, hair treatment, air freshener. For diarrhea, seep the curry leaves in hot water, once cooled, add in 1tsp honey and drink it. 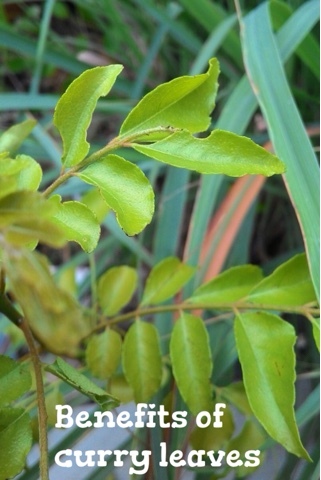 For nausea, drink 1 tsp curry leaves juice with 1 tsp lime juice. For diabetic, eat 10 new leaves or shoot every morning for 3 months. Or eat uncooked curry leaves with black pepper on empty stomach. For healthy black hair, cook the curry leaves in 1 cup coconut oil until blackened, cool it and apply as tonic. To increase chance of having kid, eat lots of curry leaves. To cure bruise and swollen, crush the leaves and apply on the bruised or swollen place. To have smooth skin, eat the leaves everyday. Make a small cut all over meat of choice, example chicken. Fry the onion paste, curry leaves, potato with the meat of choice. Once they are half cooked, pour 2 cups of water, leave to simmer and occasionally stirred. Once the broth is reduced to half, add salt to taste. If needed, add the last cup. I usually stop after 2 cups. Delicious eaten with warm rice. Add green veggies for balanced meal. No coconut milk, no milk, less fat but taste oh so good. Tips on staying healthy during grocery shopping.